Red Beans and Rice – A traditional southern favorite. Our Red Beans and Rice has garlic, onions peppers in tangy, not too spicy sauce. ●Sweet Potato Bake – Whipped sweet potatoes spiced to perfection. 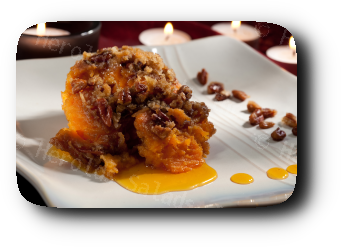 ●Sweet Potato Casserole – Diced, seasoned sweet potatoes, baked with pecan coconut crust. Items marked ● requires ordering two days in advanced.